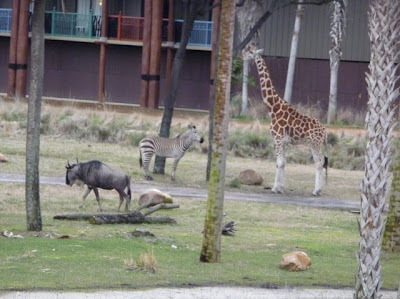 so, we had timeshare points to kill, which seems to happen a lot in february the past couple years, so we spent a weekend at the animal kingdom lodge. we stayed in the new kidani village, which is the new part of the lodge, where they only have disney vacation club rooms. so there is none of that riff-raff that only can afford to pay hundreds and hundreds of dollars a night for a room. at kidani, it is exclusively the people who paid thousands for years and years of access. yet we still ended up with noisy yahoos on the next balcony over. so much for exclusive. we did still get tremendous views of the savannah (see above), with giraffe, and zebra, and some animal that looks like what happens when a giraffe and a zebra get left in the same barn accidentally overnight. there were also various cattle looking things, and deer looking things, and elk looking things. and ostriches. as far as a view, it was cool. we had dinner at the new restaurant in kidani. its called sanaa, which in swahili means "work of art." sets a high bar, but it was pretty good. the web site says it it is african food with indian flavors. i honestly don't know enough about either to differentiate, but its all good. what it seems like to me is that the assumption is that the resort is african-themed, even though its really not, and that they wanted to do an indian restaurant, which would have been a perfectly legitimate fit on its own, but they needed to justify it somehow. i don't know. anyway, there were three things on the menu that allowed for multiple selections in each course, so we did those and split them. there was the bread service, which is sort of what they're known for. y'know. in some circles. like among people who would know that a restaurant is known for its bread service. admittedly, it's not a big club. but i'm in it. anyway, they have four breads and six accompaniments. you get to choose three of each. all were flatbreads. we got the naan, which is classic and plain, the onion kulcha, which was filled with sweet onion and spices, and a paneer paratha, which was very spicy. paneer is a cheese. i was looking for the cheese, but i wasn't aware of any cheese as i was eating. for the toppings, we picked the garlic pickles, which was kind of like a spicy relish, the cucumber raita, which is a yogurt-based sauce, and tamarind chutney, which was smooth and tangy. i mixed them up, trying various toppings with various breads. 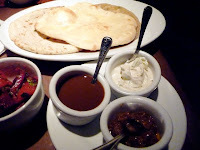 i liked the raita with the paratha and i liked the pickles best with the naan. i think my favorite topping was the chutney, but i didn't think it went well alone with the breads. i thought it would have been awesome on a grilled chicken sandwich or something, though. they had a salad sampler, so we got that. they offer five and you get to choose three. 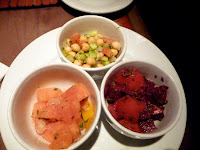 we chose the chickpeas with cucumber and tomato, the watermelon with radish and lime, and the roasted beets. i have been told that i have a rep concerning beets. i'm ok with that. all of them we're really good. i am allergic to watermelon, but i am ok with it when its really fresh. my allergy manifests in my hands getting itchy. they did not. so, good watermelon. they had a braised meat sampler for an entree. they had three braised dishes, and you could choose two. we picked the chicken with red curry and the beef short ribs. liked both. the ribs were very good, but i have no idea what was either african or indian about them. they just tasted like a good short rib to me. the chicken was all dark meat, best i could tell, which makes sense in a braise. but it was really, really tender. it was in a tomato-y sauce that was really good. we got the five-grain pilaf to go with it. you can't really beat getting five kinds of rice all at once. thought about skipping dessert, but decided i wanted to try something. nothing jumped out, but i noticed the orange-sesame cake came with passion fruit kulfi. i remembered having a kulfi at tabla and new york and thinking it was awesome, so i got that. the cake was cool. 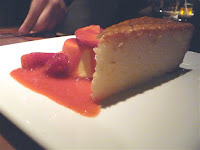 nice orange flavor, and the top of the cake looked like one of those sesame candies, but it was soft. and the kulfi, which is sort of a cross between a frozen mousse and ice cream, was awesome. i love that texture. it's now on my list of things to replicate. the next night, we went to boma, which is the african buffet in the old wing of the animal kingdom. usually, we get a reservation there, and we still have to wait an hour or so for our table. on this trip, we decided to go there that day. when i called in the morning for a reservation, they said we could have 430 or 9. no thanks. so we went over at 645 to see what the wait would be just walking in. they said 45 minutes to an hour. we shrugged and said sure. then we were seated in less than 10 minutes. i swear it was shorter than any wait we have ever had there with a reservation. the highlight of that dinner was the corn and spinach pudding. never had that before, and why it was not among the desserts, i have no idea. it was delicious, and very sweet. loved, loved, loved it. the other thing that was cool was that they had pap with chaka laka. i just wanted to type that. its basically grit cakes with a chunky tomato sauce. good, but mostly a cool name. except for the fact that we missed the cats, totally successful weekend.